Anyone who cooks knows that herbs and spices are used to flavor foods. They are what define the different regional cuisines of the world. Herbs and spices change plain foods into tasty dishes. 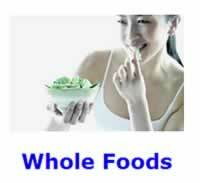 Seasonings will develop and extend the natural flavors of the raw whole foods used in your meals. Herbs and spices have been used to preserve food for thousands of years before modern refrigeration was developed. Herbs and spices are a concentrated source of antioxidants and other plant factors. Cooking with herbs and spices is a quick way to add diversity to your diet. Adding a moderate amount of herbs and spices to your food goes a long way towards boosting the health value of a meal. Fruits and vegetables have long been viewed as a rich source of antioxidant compounds and other plant factors that promote good health. The Health Establishment has, also, been urging people for years to eat more fruits and vegetables. The antioxidant activity of culinary herbs and spices suggest that in addition to imparting flavor to food, they possess potential health benefits by inhibiting lipid peroxidation. Research indicates that adding a moderate amount of herbs and spices to your food goes a long way towards boosting the health value of a meal. Think of them as a quick and easy way to get a concentrated source of antioxidants and other plant factors - without all the extra calories of whole foods. They are also a quick way to add diversity to your diet. Herbs are the leaves of herbaceous plants. Spices come from the other parts of the plant, such as the bark, root, bud, or berry. Herbs actually have been shown to have higher antioxidant activity than fruits, vegetables and some spices, including garlic. The green leaves in general are richer in antioxidants than other plant parts because that's where the oxygen in the plant is produced. In general, fresh herbs and spices taste better and contain higher antioxidant levels compared to their dried counterparts. For maximum spice flavor, buy spices whole and grind them prior to use. To release the flavor of dried leaves or herbs, crush them just before using. It is suggested that you grind up dried herbs in a culinary mortar and pedestal for maximum flavor. Use whole sprigs to infuse long-cooking dishes with flavor; but remove before serving. Remember that anything that improves your health is worth doing. There is nothing seriously wrong with cooking with dried herbs and spices. Some herbs suitable for steeping as teas are oregano, rosemary, peppermint, sage, spearmint, savory, ginger,Â and thyme, all of which have been shown to contain significant levels of antioxidants. The antioxidant activity of herbs were retained even after boiling for 30 minutes. Try adding sprigs of fresh rosemary or oregano to the cooking water for tea, vegetables, rice, and pasta. A spice made from the dried aromatic inner bark of certain tropical Asian trees. Thin strips of the inner bark are sun dried to form tightly curled quills. Traditionally used in desserts, sweets and savories. Cinnamon is delicious in cakes, pies and buns, and it enhances most meat stews. Cinnamon exhibited the second highest antioxidant activity of seven Indian spices. Cinnamon improved glucose metabolism (antidiabetic agent) the best of some 49 herb, spice, and medicinal plant extracts. A spice made from the dried, unopened bud of an evergreen tree native to the Moluccas and widely cultivated in warm regions. Traditionally used in baked goods and sauces. Good with pork, ham, stews, carrots and beets. Also used in chutneys and in stewed fruit dishes. Cloves exhibited highest antioxidant activity of seven Indian spices. Cloves improved glucose metabolism (antidiabetic agent) the 7th best of some 49 herb, spice, and medicinal plant extracts. Cumin, a spice, is the seed like fruit of an annual Mediterranean plant in the parsley family. It has a dominant pungent and bitter taste. Traditionally used to make curries and chili powders. Great in vegetable soups, barbecues, couscous dishes, rice, and meat stews. Increased glutathione-S-transferase activity high enough to be considered as a protective agent against carcinogenesis. A spice made from an onion like plant of southern Europe having a bulb that breaks up into separable cloves with a strong, distinctive odor and flavor. It has a pungent and sweet flavor. Garlic's flavor comes from sulfur compounds that are exposed when the membranes of the individual cells are severed or broken and come in contact with the air. It is the allicin that is thus formed by chemical action that has the familiar garlic smell. Dry powdered garlic has no allicin left in it and does not cause garlic breathe. Traditionally used in pot roast, meatloaf, barbecue, and on eggs. When sauteing - chopping garlic finely will produce a stronger flavor then if the same amount is used but just cut in chunks. Sautéing for a long period of time will lessen the strong flavor of the garlic. In stewing or boiling, garlic loses all its pungency whatsoever and has a nutty-sweet flavor. Adding the spice ginger exhibited synergistic antioxidant activity. Its ability to lower Cholesterol is largely overstated because that effect requires the consumption of about 7 grams of garlic a day. Garlic and its constituents (i.e., allyl sulfur compounds & selenium) can suppress carcinogen formation, carcinogen bioactivation, and tumor proliferation. A spice made from the pungent, aromatic rhizome of a plant of tropical southeast Asia having yellowish-green flowers. It has a peppery pungent taste. Traditionally used in Asian and Indian dishes. Ground dried powder is good in soups, baking, rice dishes, and marinades. Use crystallized ginger in baking; fresh ginger in marinades or with fish, meat, and vegetable dishes. Adding the spice garlic and/or onion exhibited synergistic antioxidant activity. "Ginger is effective for relieving the severity of nausea and vomiting of pregnancy." A bulbous plant cultivated worldwide as a vegetable. The rounded, edible bulb of this plant, composed of fleshy, tight, concentric leaf bases having a pungent odor and taste. While not a true herb or spice, it is often used to flavor foods. Sweet onions have low sulfur content. Yellow onions, the most common cooking variety, have the strongest flavor. Traditionally used to improve just about any savory dish. In general, cooking mellows the flavor, and the longer the cooking the more pronounced the subduing effect. SautÃ©ing over medium-high heat brings out more flavors. An excellent bioavailable source of quercetin, a flavonoid/antioxidant. A perennial Eurasian herb of the mint family, having aromatic leaves that are used as a seasoning. Traditionally used in Italian, Greek, and Mexican cooking. Marvelous in tomato sauces, barbecue, and meat, poultry, and seafood dishes as well as eggplant and bean dishes. Oregano is also good in oil and vinegar salad dressings. Oregano exhibited the second highest ability to inhibit lipid peroxidation. Oregano had 3 to 20 times higher antioxidant activity than the other herbs studied. A mild, powdered spice made from sweet red peppers. It is a red pepper powder. Traditionally used in potato and egg salads, fish, shellfish, and poultry. A basic spice in Hungarian goulash and paprikash. A herb which comes from an aromatic evergreen Mediterranean shrub having light blue or pink flowers and grayish-green leaves. It has pinelike, camphor flavor. Traditionally used in Italian cooking, with lamb, poultry, pork, veal, beef, roasted potatoes, green beans, limabeans, peas, and mushrooms. Rosemary exhibited the highest ability to inhibit lipid peroxidation. A spice made from the powdered aromatic, somewhat fleshy rhizome of a widely cultivated tropical plant of India, having yellow flowers. It has a mustard yellow color. Traditionally used in Indian cuisine, mustards and curry powders, providing color and flavor. It's often used in bean and lentil dishes, pilafs, and in cauliflower and potato dishes. Curcumin and turmeric extracts have several pharmacological effects including antitumour, anti-inflammatory, antioxidant and anti-infectious activities.